Faraday was shocked to discover on Friday that the tooth fairy looked remarkably like his "V-E-T." But after all the pain and suffering, we didn't have the heart to tell him he wasn't going to get any coins under his pillow that night. Besides, we're pretty sure he preferred the giant jar of PETCO tuna flakes over cold hard cash, anyway. But why did he have to have all those teeth pulled? What was the cause? More importantly, was there anything I could have done to prevent it? In an ironic twist, Maxwell of the Bad Teeth got a big ol’ gold star from the vet during his wellness exam a few weeks ago. His teeth are looking tons better than they did a year ago, and our veterinarian feels all the preventive things we’re doing at home are the reason. We have Healthy Mouth water additive, and Biotene oral gel in play - both of which are certified by the Veterinary Oral Health Council. So... then what’s up with our little guy? Turns out Faraday’s problem had nothing to do with not brushing. No dental chews would have helped here. Water additives don’t do a thing for this condition. What plagued Faraday is something called tooth resorption – and veterinarians have no idea what truly causes it. 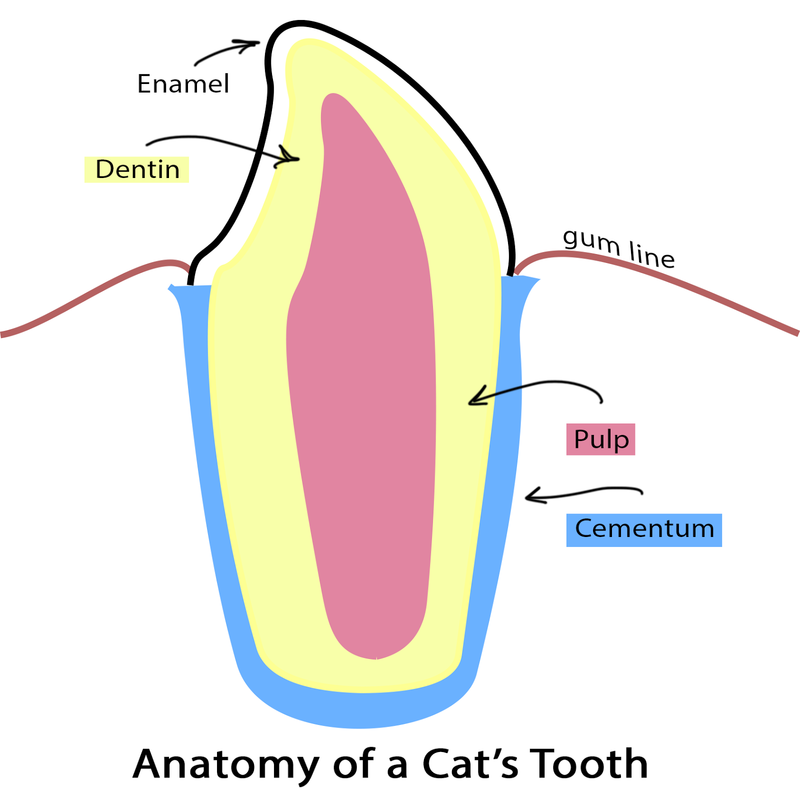 Think of a cat’s tooth as a bunch of concentric ovals, one inside the other. 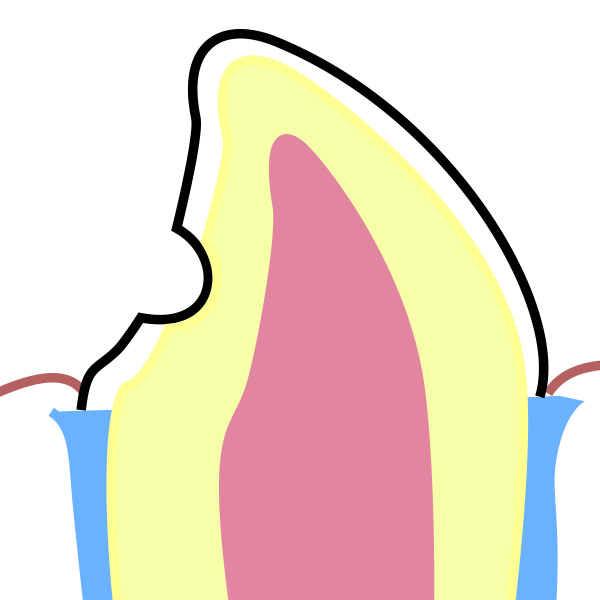 The outermost layer above the gum line is the enamel. This layer is very thin, but it’s the most durable, toughest part of the tooth. It also happens to be the hardest substance in your body – whether you’re human or feline! The next layer takes up the most real estate, and is made from a bone-like material called dentin. Inside the dentin is a very soft substance – the pulp of the tooth. A lot goes on inside this pulp – it’s the rich environment that feeds and nourishes the tooth, and it serves as the tooth’s nerve center, as well. Quite literally, since there are nerves running throughout the pulp! These nerves serve as the security and alarm system, letting you know when something’s going wrong, by sending you signals of sensitivity or pain. The illustration above shows you what a healthy tooth looks like. This diagram is of a feline premolar – the teeth on the side of your cat’s mouth (but not the big molars all the way to the back). With tooth resorption (or TR), the outer layers begin to be eaten away and the roots actually resorb into the jawbone until the tooth becomes irreparably damaged and there is no option but to remove it. Removal can be a dicey process, too, as these teeth are often so compromised that they have become brittle and may shatter during extraction. As the resorption progresses and the nerve center of the tooth – the pulp – is exposed, a cat can experience a terrific amount of pain. Of course, cats are notoriously good at hiding their pain, so you may have to do a bit of sleuthing to see this. Indications of a painful mouth can include drooling, a preference for eating on one side of the mouth, and suddenly developing the habit of swallowing food whole so it doesn’t have to be chewed. 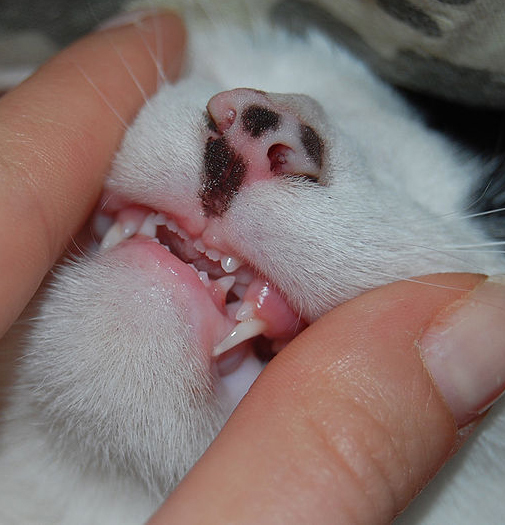 If your cat will let you, take a look at his teeth and see if you notice any red spots on the surface of the tooth, or – in Faraday’s case – gaping holes. TR may sound like “kitty cavities” but it’s not. Cavity prevention treatments exist. They don't exist for TR - at least not yet. And that's mainly because you need to know the cause before you can know how to prevent it! As I mentioned before, no one really knows what causes resorption, but a few studies over the last decade have cast suspicion on one thing: diet. Specifically the amount of Vitamin D in a cat’s diet. Wait, what? Cats cannot absorb Vitamin D through their skin, (much to their chagrin - after all, they so love those sunpuddles!). So they need to get their vitamin D from the foods they eat. The challenge is to determine how much is too much. Because the only way a cat will get vitamin D is through the food he eats, it's good that pet food manufacturers add this as a supplement into their foods. However, a 2006 study found that 41% of canned cat foods had more than 30 times the amount of vitamin D recommended for cats. And a quick look at the FDA’s site on pet food safety shows a flurry of recalls during the summer of 2012, due to excessive amounts of Vitamin D found in cat food. This comes after the AAFCO revised its guidelines to include a maximum recommended amount of vitamin D in cat foods. It's notable that in previous years, no maximum had been set. So what’s wrong with a lot of Vitamin D? One way this hazard may be manifesting itself is through tooth resorption. Since 2003 there have been a few studies that have found correlations between excessive amounts of 25-hydroxyvitamin D (also known as vitamin D3) and cats suffering from TR. Another study recorded the impact vitamin D had on dental and gum tissue when large amounts of vitamin D3 and vitamin D metabolites were introduced. The changes recorded were very similar to those seen in TR-damaged teeth. Wow, have we found the "smoking gun" for TR? Hold on, not so fast. Hot on the heels of all these studies came a report out of the Journal of Veterinary Dentistry that found the inverse: in another study including 64 cats, the ones with TR had much lower vitamin D serum levels than the ones without. However. It must be noted that all 64 of these cats were fed a dry premium cat food their entire lives. No canned food in this study anywhere. And it wasn't the dry food that was discovered in 2006 to have excessive levels of vitamin D - it was the wet food. So until a new study is commissioned that investigates tooth resorption in cats fed wet diets, all we have are conflicting studies and a lot of questions. Whether or not TR can be attributed to vitamin D is still highly speculative. What is incontrovertible, though, is that high levels of vitamin D can pose a health risk to your pet. Low levels of vitamin D are equally dangerous. So moderation is key. Most pet food labels list vitamin D or vitamin D3 as a supplement added to your cat’s food, but they do not include the amount the food contains. Dr. Brett Beckman of DVM360 Magazine recommends no more than 250 IU/kg dry weight equivalent per day. This differs from published AAFCO guidelines, which establish a 500 IU/kg minimum and a 10,000 IU/kg maximum. That's quite a range! Because of this, on Friday I sent an email to the company that makes Faraday's food, asking for that information. It may not make any difference in the long run, but I will feel better once I know. Until the vitamin D debate is solved, there are a few things you can do if your cat has been diagnosed with TR: consider taking your cat in for dental checkups twice a year instead of just at the annual wellness exam. As there is some talk about inflammation playing a role, you might consider brushing, if your cat will tolerate it. Or rubbing an anti inflammatory product like EFAC (Ellagic fatty acid complex) periodically on the gums. We hope veterinary medicine is able to identify the causes of TR soon, so we can work to actively prevent it in our pets. In the meantime, the use of dental water additives like Healthy Mouth - and dental pet chew treats - certainly can’t hurt! Tooth Resorption and Vitamin D3 Status in Cats Fed Premium Dry Diets, Journal of Veterinary Dentistry. Fall2010, Vol. 27 Issue 3, p142-147. 6p. I am not a veterinarian, and the information provided here is not intended in any way as a substitute for professional veterinary care. Nor should it be used to self-diagnose for your pet. This information is for educational purposes and to provide you with reputable documentation you can use to pose informed questions of your own to the veterinarian of your choice. 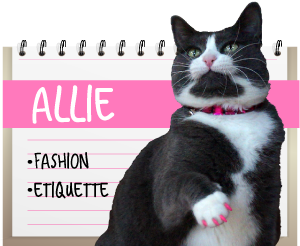 BlogPaws Nose-to-Nose Nominations Now Open! Click here (or on the image above) to be directed to the BlogPaws Nomination Page. If you decide to nominate us, we would be so honored. Some of these categories ask you for links to specific posts that you feel best represent the category. Click here for our faves (with links & all) at the bottom of Thursday's post. Resorptive lesions are such a frustrating problem. I'm glad Faraday is recovering well. Even though brushing won't prevent those lesions, we believe it's still the best way to keep your cat's teeth healthy otherwise. While water additives and gels may help, we don't think they're nearly as effective as brushing. Ingrid, we agree totally. Sadly, we're just not in that camp! 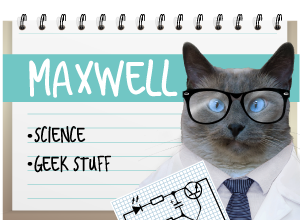 Faraday totally flips out when his mouth is touched, and with Maxwell, brushing actually hurts his stomatitis/gingivitis, making it worse. Thankfully, the Biotene gel works really well preventing plaque buildup with him. That was really interesting. We wondered if it just happens in cats or other animals too? Off to Google it and take a look. Have a marvellous Monday. Mommy said this actually made her teef hurt to read this and we hope Faraday is feeling much better today. He is lucky to have such a good Mommy! Very interesting...I just have Bucky now but when I had Tillie and Annie they both had TR, and I know Bucky had a small tooth removed last year but don't know if it was due to TR. Since everyone was on wet food it makes me wonder. Bucky loves having his teeth brushed but can't tolerate the toothpaste,so I'm not doing it anymore...anyone know what else can be used? Our Foster cat Tulip had TR and had to have four of her teeth pulled. She started hiding which is how we knew something was up. We hope Faraday is feeling well now. Poor Faraday! Me issending many kitty kisses and thanks for all the information on Vitamin D! We did not know about any of that! We had no idea about this. Thank you for this very informative post! Mommy opens our mouth pretty often to look at our teeth. What an interesting post! My human had no idea what caused tooth resorption, or even what it was, really. This answered a lot of questions for her. Poor Faraday! Flynn had a FORLS tooth removed a couple of years ago. I brush his teeth every day with an oral gel. I know it won't prevent FORLS appearing in another tooth, but hopefully the brushing will be quicker to highlight any pain he may be getting so he gets treatment as soon as the problem appears. and I adore the photo of the kitten getting his adult teeth.. Eli had eight canines for a while, and I could never get a good shot of that.. I'd love to know what your pet food maker tells you about the vit D in your food..
Whoa pal, you have a similar problem like me only different diseases. I feel for you pal. It's so good you have humans that love you and want to do the right thing and took you to a specialist. We hope this solves all your problems. Actually brushing would not have saved my toothies either. But we always recommend people brush because it does prevent lots of other problems. Wow, great information! It's not something I've had to deal with so I only know the basics. VERREH interesting! Of course, now Mommy will have to EXAMINE all our teefs...run! Thanks for that info! We knew dental health is important to us cats, but we didn't know much about TR. We're glad Faraday is doing better now after having his teef removed. The peeps are convinced that the reason I stopped drinking water is because they started putting those dental additives in it. I wouldn’t drink the water with the additives and I wouldn’t drink it after they stopped using it. My vet said that Bartonella causes cats to have bad teeth too. My peeps take tons of Vitamin D3. They worship it but I don’t know how much I get. Thank you for this very informative blog post. I had no idea this condition existed and hope research manages to find a cure. 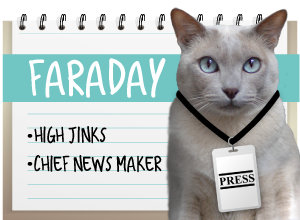 Lots of love and good wishes to Faraday. Poor Faraday. We hope he's feeling better now. TR sounds really painful! Thank you for the informative post. I hope research can reveal the cause of TR soon so it can be prevented. Hope he feels better now ! Thanks for the great blogpost ! Hi. Thanks so much for this post. My 3yo kitty has been diagnosed with this. Her first dental/extraction is next week 😿How is your faraday doing with forls? Has anything helped (new food, supplements, etc)? It's so difficult to tell, and the jury is still out in the cause of resorptive lesions. I have Faraday on a mix of a really good wet food, grain free, and a freeze dried raw that has vitamin D3 listed as one of the very last ingredients. I heard back from the manufacturer of the Natural Balance food and it is very balanced in its D3 amount. Faraday has done much better this year, although Maxwell lost his two upper fangs. Then again, Maxie is my kibble addict, do maybe that cubes into play? I hope your baby dudes well with her extractions. Be sure to ask for pain medication and have it on board for several days afterward, even if she seems fine. They mask pain so easily, and three latest thought is that getting ahead of pain and inflammation makes for a more rapid recovery. Thanks so much for asking!